If you’re attending Photo Kathmandu, and happen to have an appreciation for other forms of art besides photography, here is a selection of events taking place across the valley at around the same time that could perk your interest. This might very well convince you to extend your stay just a wee bit longer. The annual Kathmandu Jazz Festival, by now an institution in itself, will be opening soon. Popularly known as Jazzmandu, this year’s edition of the festival, like every year, boasts an impressive lineup of Nepali and international artists such as Cadenza, The Claudia Quintet, John Hollenbeck, Daniel Stawinski, and Suresh Raj Bajracharya, among others. The week-long festival also features activities such as the Jazz for the Next Generation competition, Jazz Bazaar, Jazzmandu Masterclass, Jazz at Patan, and so on. Tihar is one of Nepal’s biggest festivals. It also happens to be one of the more fascinating—beautiful lights and decorations aside, this is the time of year when Hindus worship cows, dogs and even crows. You’ll especially not want to miss the fourth day of Tihar, when the Newars of Kathmandu celebrate their New Year and organize rallies across the three cities of the valley. Chhath is celebrated by the people of the Maithili-speaking region of Nepal and India. The festival is four days long, with the third day holding the most significance. On this day, you’ll witness people worshipping the setting sun at Rani Pokhari in Kathmandu and on the banks of rivers or lakes in the Terai. With the evenings come cultural programs filled with music and dance. The folk tunes sung during the Chhath festival reflect the culture, social structure, mythology and history of Mithila culture. Kartik Naach is an annual tantric dance festival that takes place in Kathmandu Valley. The eight-day long festival serves as a play dedicated to the Narsingha avatar of Lord Vishnu. The final day is undoubtedly the most interesting, with the enactment of Narsingha killing the demon Hiranyakasyapu. The performances take place late in the evening, so make sure to find a hotel close to Patan Durbar Square. The biennial Film Southasia is back with 35 selected offerings. The festival will also be curating eight student-made films in order to encourage budding young filmmakers in South Asia. The Kathmandu MTB Fest is gearing up for its first edition this year, where racers from all over the world will compete in two different categories. Taking place from November 20-22, the Kathmandu MTB Fest will see a host of riders competing and taking their time to enjoy the fall weather of Kathmandu and its environs. The races should make for exciting competition, whether you are someone who loves to bike and want to try your hands (or rather legs) at some high-speed racing or someone who just wants to be in the cheering crowd, you will not want to miss event. 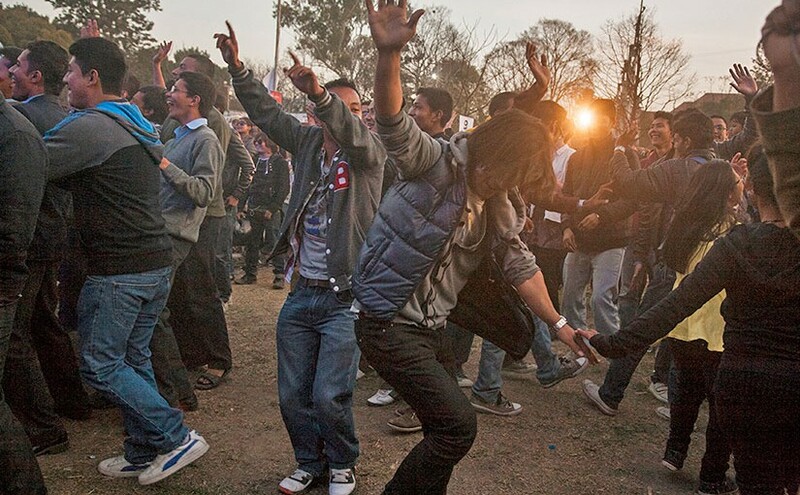 If you’re looking to check out the local music scene, you need go no further than the Nepal Music Festival. Themed as a “Thanks Giving Festival” in a show of gratitude to the volunteers who emerged after the earthquakes earlier this year, the bands taking part in this edition of the NMF include Monkey Temple, The Shadows Nepal and Kings Among Men. November will see the fifth edition of the International Folk Music Film Festival Nepal, where you’ll get the opportunity to learn about the music cultures of places such as Peru, the USA, Thailand, Mali, Iran, Chile, Mozambique, Rajasthan, and so on. The festival also has a competitive category, for which 12 short films have been selected, while five films have been selected for the non-competitive category. Besides movies, the festival will also feature presentations on various traditions. Next Next post: Lights, Camera and Action!